Last week, astronomers studying observations taken by NASA's Wide-field Infrared Survey Explorer (WISE) mission discovered the first known "Trojan" asteroid orbiting the sun along with Earth. The WISE mission is to search for "dark" objects in space like brown dwarf stars, vast dust clouds, and Earth-approaching asteroids. WISE finds them by sensing their heat in the form of infrared light most other telescopes can't pick up. "Our instrument is finding [dozens] of asteroids every day that were never detected before," says Ned Wright, principal investigator for WISE and a physicist at the University of California in Los Angeles. "WISE is very good at this kind of work." Most of the asteroids WISE is finding are in the main asteroid belt between Mars and Jupiter, but a fraction of them are different—they're the kind of Earth-approaching asteroids that keep the likes of Stephen Hawking awake at night. "WISE has already found a handful of asteroids classified as 'potentially hazardous,' including one seen in 1996 but lost until re-observed by WISE. To be named 'potentially hazardous,' an asteroid's orbit has to pass within about 5 million miles of Earth's orbit. One of our discoveries' orbit will cross Earth's orbit less than 700,000 miles away." WISE tracks each potentially hazardous near-Earth object (NEO) it finds every three hours for up to 30 hours and then produces a "short track" predicting where it will be for the next few weeks. The WISE team sends all of this information to the NASA-funded Minor Planet Center in Boston. They post it on a publicly available NEO confirmation page, where scientists and amateur astronomers alike can continue to track the asteroid. "Regional damage from a small asteroid strike can be very serious indeed," says Wright. "We need to keep surveying the skies to find these NEOs and precisely measure their orbits. If we can find the really dangerous asteroids early enough, we might have time to figure out how to deal with them." Many telescopes on Earth are already searching. Notable programs include LINEAR, the Catalina Sky Survey and others. Working together over the years they have found more than a thousand potentially hazardous asteroids. 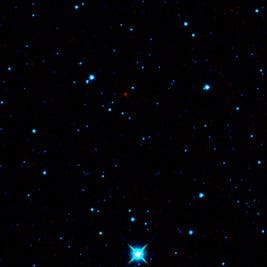 The red dot near the center of theimage above is the first near-Earth asteroid discovered by WISE. This particular asteroid, called 2010 AB78, is roughly one kilometer (0.6 miles) in diameter, and is currently about 158 million kilometers (98 million miles) away from Earth. Its elliptical-shaped orbit takes it out beyond Mars and back in about as close to the sun as Earth. Because the asteroid's orbit is tilted relative to the plane of our solar system, astronomers do not think it poses a hazard to our planet. As with all near-Earth objects, 2010 AB78 will continue to be monitored. As WISE sweeps along the circle a small mirror scans in the opposite direction, capturing an image of the sky onto an infrared sensitive digital camera which will take a picture every 11 seconds. Each picture covers an area of the sky 3 times larger than the full Moon. After 6 months WISE will have taken nearly 1,500,000 pictures covering the entire sky. Each picture will have one megapixel at each of four different wavelengths that range from 5 to 35 times longer than the longest waves the human eye can see. Data taken by WISE will be downloaded by radio transmission 4 times per day to computers on the ground which will combine the many images taken by WISE into an atlas covering the entire celestial sphere and a list of all the detected objects. Asteroids like the little red dot above are believed to be the building blocks of planets – primordial relics left over from the formation of the Solar System 4.6 billion years ago. We thought it would be a perfect follow up to examine what the scientific world thinks would happen to the human species and life on Earth in general if an asteroid the size of the one that created the famous K/T Event of 65 million years ago at the end of the Mesozoic Era that resulted in the extinction of the dinosaurs impacted our planet. The general consensus is that any comet or asteroid greater than 20 kilometers in diameter that strikes the Earth will result in the complete annihilation of complex life – animals and higher plants. (The asteroid Vesta, for example, one of the destinations of the Dawn Mission, is the size of Arizona). How many times in our galaxy alone has life finally evolved to the equivalent of our planets and animals on some far distant planet, only to be utterly destroyed by an impact? Galactic history suggests it might be a common occurance. The first this to understand about the KT event is that is was absolutley enormous: an asteroid (or comet) six to 10 miles in diameter streaked through the Earth's athmosphere at 25,000 miles an hour and struck the Yucatan region of Mexico with the force of 100 megatons -the equivalent of one Hiroshima bomb for every person alive on Earth today. Not a pretty scenario! Recent calculations show that our planet would go into another "Snowball Earth" event like the one that occurred 600 million years ago, when it is believed the oceans froze over (althought some scientists dispute this hypothesis -see link below). What keeps the Earth "safe" at least the past 65 million years is the massive gravitational field of Jupiter, our cosmic guardian, with its stable circular orbit far from the sun, which assures a low number of impacts resulting in mass extinctions by sweeping up and scatters away most of the dangerous Earth-orbit-crossing comets and asteroids. In 1995, astronomer George Wetherill calculated that without Jupiter, the impact rate on Earth by comets and asteroids would be 10,000 times higher. Under such bombardment it is hard to conceive of how complex life would survive.